Yesterday evening, Cinecultist braved the sauna otherwise known as the New York subway system during this heat wave, to head out to Brooklyn for a screening of The Wild Bunch at BAM. BAM Cin�matek has recently kicked off a Sam Peckinpah retrospective and while CC remembers discussing the elaborate final shoot 'em scene of The Wild Bunch in grad school, we hadn't seen the rest of this canonical Western. A steamy August night seemed like as good enough time as any to remedy that. Sometimes when you watch something that you've heard is "good" or "art," the experience is transformative and it's instantly clear why its lauded. Watching Buster Keaton movies for the first time can be like that. (CC has Keaton on the brain because Film Forum is doing a Mondays series of his movies in August and September. Go see some if you can.) But other times, what was obviously the innovation at the time seems dated to our modern eyes, probably because its been ripped off so many times it's now clich�. Casablanca springs to mind as a classic example of that type of old movie. The Wild Bunch fell into the later category for CC and our viewing pal, JP. What must have seemed so shocking at the time, like the indiscriminate violence during the shoot outs and the moral blackness of all of the characters, feels very tired now. Also, stylistic flourishes like the tough guy swaggering dialogue or the creepy, extended laughter amongst the bunch after they've narrowly escaped a bloody death, was just off-putting and bizarre. Equally weirdo was the movie's depiction of women from huge bosomed whores take a wine vat bath to a former love who's now with the evil general being shot point blank by her lover. Talk about women as objects, this movie really optimizes that ickiness. While this wasn't a movie Cinecultist would be happy to see in the theaters today, as a cultural artifact, it's oddities make it sort of interesting. It's how we feel about Westerns in general. Mostly they're boring because CC doesn't get them on a visceral, personal level. As a genre, they don't say anything to us about our experience. Yet, the fact that they're so alien makes them intriguing as case studies. They don't entertain but they make us think. 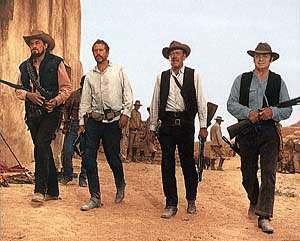 What did The Wild Bunch say about the Vietnam era? Why does that seem to be so different than now, even though our country is again in a quagmire of a foreign dispute? Was blood that looked like just tons of red paint really scary in 1969? Was this movie the beginning of our current trend of quick cutting action films? All of these questions are still swirling around hours after seeing this movie that we could easily say we didn't like. So, in conclusion it was a movie going experience we liked, even if the movie itself wasn't our cup of tea. BTW, if this whetted your Peckinpah fascination, here's a nice career overview on Senses of Cinema.